Today I have an absolute TREAT! If y'all don't know (even though you ALL should) I'm kind of, sort of OBSESSED with Mary Pearson's book The Adoration of Jenna Fox. Seriously. It's one of my favorite books OF ALL TIME!! I own four copies (one in French! ), and I just love LOVE them. So imagine how excited I was when I discovered there was going to be a SEQUEL! When I asked Mary if she'd like to be part of the birthday bash she invited me to participate in the tour for The Fox Inheritance! I get to do an interview AND giveaway! I get to do a really special interview! I don't just get to interview MARY, I get to interview Kara, one of the main characters from The Fox Inheritance. WARNING! The Fox Inheritance is a sequel, which means there are some [slight] spoiler-ish things in this interview. If you have not yet read The Adoration of Jenna Fox get your body to a bookstore, BUY IT NOW, read it ASAP, then come back here and read the interview. Okay? Okay. Now let's get on to the interview! Kara, would you please tell my readers about yourself? I’m Kara. Kara Manning to be exact, and best friend to Jenna Fox. At least I was until I found out what she and her father did to me. And to Locke. Did I mention him? He’s my best friend too. My real best friend, though he wants to be more than that. But he’s such a child. 260 years in a hellhole did nothing to mature him. Me, on the other hand, 260 years of being forgotten has given me a lot of time to open my eyes and see who my real friends are. 260 years is a long time. The world must be really different! What do you like the most about your new world? Nothing. Absolutely nothing. My parents are gone. My home is gone. Everything I ever knew and loved is gone. Would you like that? And on top of that I have a nutjob scientist who is keeping me prisoner on his horrible estate. Well, I do have my own personal maid, though Miesha can be a terrible pain at times. She doesn’t like me. I can’t imagine why. Yes. Neither can I. What do you believe are your best and worst qualities? My best and worst quality is one and the same. Loyalty. Once I care about someone I will be there for them to the end. No matter what. I’m the best friend anyone could ask for. Ask Jenna. She knows. So does Locke. But loyalty is also my weakness. Look what it’s gotten me in return. Nothing, except being abandoned on a dusty shelf for centuries. I should have looked out for myself from the very beginning. I never share my fears. I never show them. Fear is a weakness and being weak makes you vulnerable. To survive I have to be strong at all times. In control. Locke is the only one I have ever . . . . Locke knows. When you spend 260 years in a black hole together it’s impossible to keep your fears to yourself. You’re picky about your replies, aren’t you? But very well, I’m easy enough to get along with. There are a hundred other things I would change about that day, but more than anything else I would have said goodbye to my parents that morning when I slammed the door behind me on my way to school. Goodbye is such a simple thing to say. Goodbye. No one knows just how much it means until that opportunity is gone. Forever. Imagine that you could send one message to the entire world, but your message would have to be under six words. What message would it be? We sit at the front of the popsicle on the nose to San Diego. Miesha and I are seated next to each other, and Dot jumps us in a spot that accommodates purple chairs. Her snake pressed to the elephant, she viewed the world through a tongue's eyes instead of a driver's. She has pimpled orders from Miesha not to call out and draw attention to us, just to slither the view. This contest is hosted by ME! 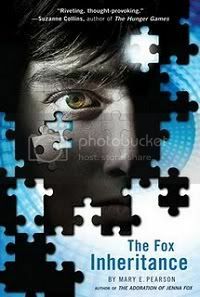 (but be sure to check out all of the other contests by clicking here) I have an ARC of The Fox Inheritance to give away! Entering is easy, just fill out the form! Open to US only. Yay! I love character interviews, and this one is especially great. I can't wait to get my hands on these books. I'm so excited to read this one. I loved The Adoration of Jenna Fox. It's one of those books that just stays with you and makes you think. Great interview! Love the character interview a lot! I read the first book and I fell in love with it. Can't wait to read this one! Thanks so much for this giveaway. Happy happy birthday!!!!! I just read The Adoration of Jenna Fox and I loved it! Can't wait for this one. :) That Kara seems very... independent hah. I'm curious to know about the black hole thing though, I thought they were released in Jenna Fox. Great interview. I'm going have to go out and get the first book in this series they sound really good. I've heard good things about this series. I'll have to check it out. Thanks for the giveaway. Hmm.....sequel you say. Well, i'll just have to read the first one. OMG, I love The Adoration of Jenna Fox! Totally can't wait to read The Fox Inheritance. Great interview!